The Deluxe Ski and Boot Bag Combo from Athalon keeps your gear protected while making your equipment easier to store and travel with securely. Constructed of durable and water repellent Athalon sport nylon and polyester, the Deluxe combo is sure to stand up to years of skiing adventures. Fabric Water repellent Athalon Sport nylon and polyester. 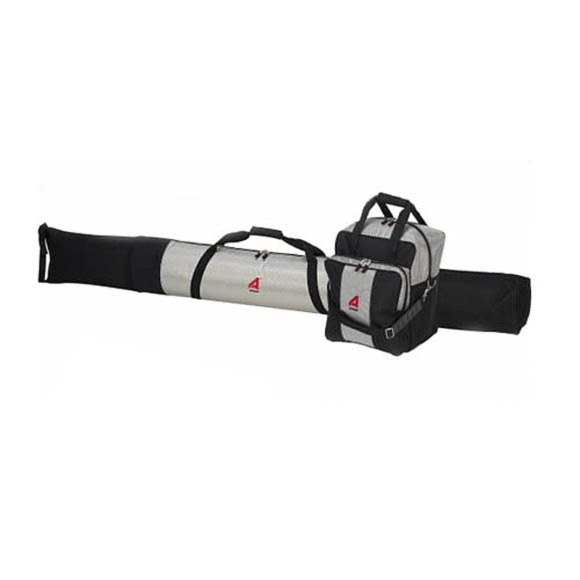 Volume Ski bag holds one pair of skis up to 190cm, boot bag holds one pair of boots. I haven't had this set for very long yet so not sure how it will hold up, but it seems to be a nice set. My boots and helmet did fit with a little moving things around a few times to get them in there. There is also an outer pocket, but it is not large enough to fit a helmet into. Good for gloves and other items though. I bought 2 of these bags. One for downhill skis and one for my cross country skis. My cross country skis barely fit so make sure your skis will fit. My cross country poles have large baskets on them and they still fit so there is plenty of room.